My European travels are made possible in large part by the kindness of my German relatives, who board, entertain, and help transport me about. 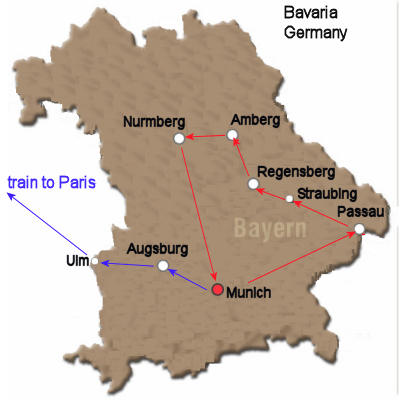 My German cousin Frieda has organized some travel within Bavaria, the route of which can be seen on the map (left). My grandfather grew up on a farm near Straubing. Some of my relations still live there. Frieda's grandfather and my grandfather were brothers. My grandfather also had a sister, and Frieda has also arranged for me to meet and stay with members of that family. 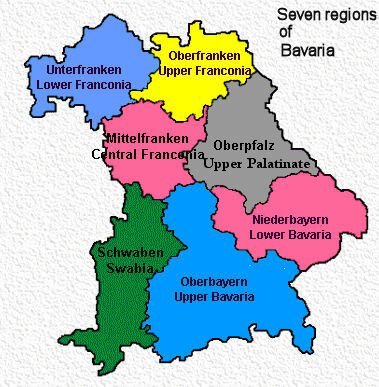 Here are the regions of Bavaria. 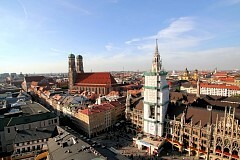 Munich, located in Upper Bavaria, is the Bavaria capital. Passau and Straubing are in Lower Bavaria. Amberg and Regensburg are in the Upper Palatinate, while Nuremberg is in Central Franconia. 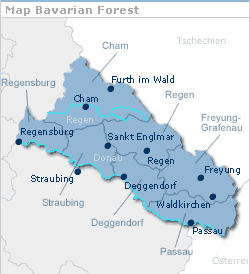 The Bavarian Forest (German: Bayerischer Wald) upland area rises to the north of the Danube between Regensburg and Passau and follows the wide curve of the river from north-west to south-east. Munich has excellent public transportation. 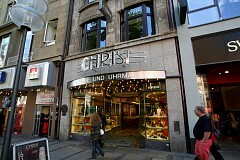 I am spending the first few days in the city and will spend several more after my loop around Bavaria. This day I took the train from Pasing to the Karlstor stop. To me, everything's an adventure when traveling in a foreign country. Walking from the Passing train station, this canal which runs to Nymphemburg Castle is always the key to finding my cousin's house. It's early fall, the leaves are just beginning to turn color, and there are many chestnuts on the ground. 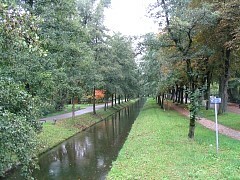 The water in this canal runs very fast: trout-stream fast. I think I actually saw trout fry in the water. I understand no German, so I couldn't figure out which train pass to buy. A young family came by, I watched what button they pushed, then I put my euros in and pushed the same button. I was rewarded with a 10 trip pass, a streifenkarte. No one checks to see if you have bought a pass. There are places to stamp the time on your pass as you use it up. If you are ever caught without a stamp within 2 hours of the time you are examined, you are in big trouble. It's practically the honor system. I have to admit more than once I forgot to stamp my card. 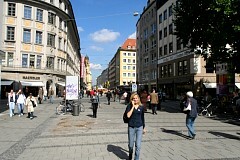 The center of Munich has many streets where no cars are allowed. 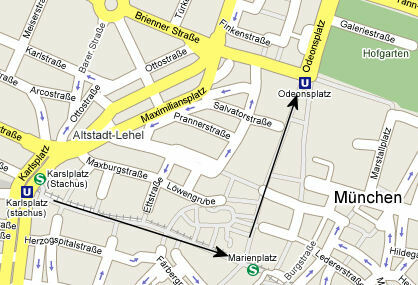 I am going from Karlsplatz to the Marienplatz then up Theatinerstrasse street to the Odeonsplatz. I have arrived during the last warm sunny weather of the fall. Consequently, it was a good time to sit in one of the small street-side cafes and people watch. Of Munich's original five city gates, only three remain: the Karlstor, Isartor and Sendlinger Tor. 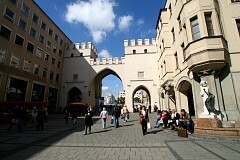 This Munich inner city gate is Karlstor (Karl's gate). It was part of a large 14th century city wall which replaced a smaller 12th century city wall. The city wall was destroyed around the year 1800, with the Karlstor becoming the center of a new square named Karlsplatz. Two buildings were built next to the Karlstor, forming a symmetrical half circle, symbolizing the opening of the city towards the outside. This picture illustrates several things: Munich has many attractive women, and I noticed that a lot of younger people seem to smoke. European's seem to pride themselves on healthy living, yet this obviously unhealthy habit is widespread. Fashion wise, boots are in. I would say 20% of women 20-35 are wearing them. A little farther up the same street the scene shows a range of ages, from the very young in a stroller to older gentleman from the last generation wearing a hat. Munich also has a streetcar line. When you venture out of the city center, one has to be aware of and ready to dodge 1) other pedestrians 2) bicycles 3) cars 4) motorcycles and 5) streetcars. The most prominent structure on the Odeonsplatz is the Feldherrnhalle or Field Marshal's hall, which sometimes makes the Odeonplatz look like an Italian square. 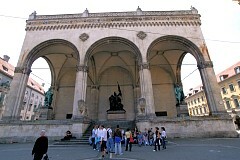 The Feldherrnhalle consists of three arches, with at the entrance two Bayern lions. In November 1923 Hitler's Beer Hall Putsch was crushed in the street just to the left of the Feldherrnhalle. It's a dark location, consequently this photo is not the greatest quality. The Feldherrnhalle was commissioned by King Ludwig I to honor the Bavarian army and its victorious generals. 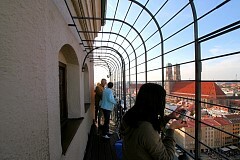 It was designed by Friedrich von Gärtner and built from 1841 to 1844. The bronze statues of Count Tilly and Prince Wrede were sculpted by Ludwig von Schwanthaler and cast from melted-down cannons. The "army monument" in the center was added in 1892 by Prince Regent Luitpold. This monumental bronze group created by Ferdinand von Miller commemorates the German-French war in 1870/71. The marble lions flanking the steps are the work of Wilhelm Rueman and date from 1905. Just north and the west of the Feldherrnhalle is the copper-domed Theatinerkirche or Theatiner church. The church was built in Italian high-baroque style after the San Andrea del Valle church in Rome and was designed by Agostino Barelli. He also led the construction of the church from 1663 to 1669. His successor, Enrico Zuccalli finished the 71 meters/233 ft high dome in 1690 and added two towers, which originally weren't planned. The current facade in late rococo style was only finished in 1768 by François Cuvilliés. The two small towers catch the eye with their curled shapes, and together with the towers of the Frauenkirche and the Peterskirche, they define much of the Munich skyline. Obviously, it's undergoing some renovation. Oktoberfest is starting on Saturday - just a few days from now. 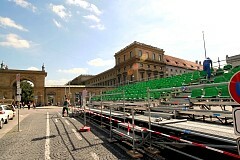 Here in the Odeonsplatz workers are setting up bleachers where people will view the opening parade. In the background is the Residenz Palace. From 1385 to 1918 it served as the home of Bavaria’s monarchs: now it's a museum. Unfortunately, I have not had the time to check it out. I visited the Pinakothek Der Moderne (in English, The Modern Art Museum). Together with the Alte Pinakothek and the Neue Pinakothek is part of Munich's "Kunstareal" (the "art district"). Pinakothek der Moderne was inaugurated in September 2002 after seven years of construction. It houses various art movements of the 20th century in the collection, including Expressionism, Fauvism, Cubism, New Objectivity, Bauhaus, Surrealism, Abstract Expressionism, Pop Art and Minimal Art. The museum also displays masterpieces of Video, Photos and New Media. 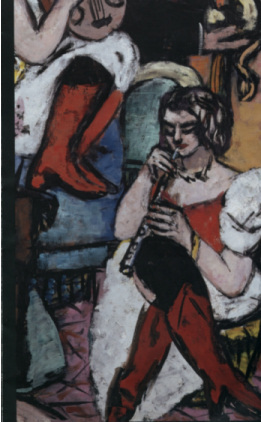 "Max Beckmann - Exile in Amsterdam" was the featured exhibition. Here are two of his works. 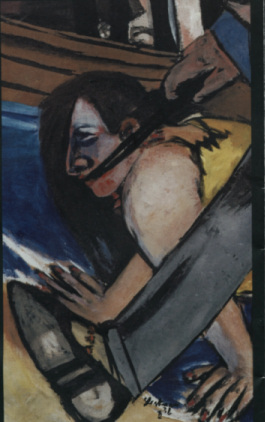 Beckmann left Germany in 1937 to get away from the Nazis and ended up in Amsterdam. While where until 1947 he produced about 1/3 of his total body of work. Needless to say, Beckmann's work is "controversial". As I stated before, I am no art critic. I would characterize his work as a smattering of symbolic swords mixed with naked female butts and breasts all set in a background of cafes and other social settings. It depicts decadence and anything goes. I can see where in conservative Bavaria under Fascist control in the 1930's would frown upon some of Beckmann's work. Back near the Marienplatz, which is the city center, I noticed people way up on the steeple of a nearby church. Hey, I want to climb up there too, so I scouted around until I found where to find the stairs. 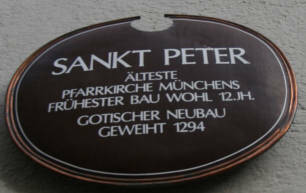 Affectionately known as Old Peter, St. Peter’s Church is the oldest in the city of Munich. The climb is lengthy but all in all not difficult. On a clear day when visibility is at its best and you may be able to see all the way to the Alps. 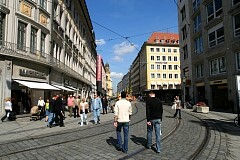 In this picture, the lower-right corner shows the Viktualienmarkt. Established in 1807 by decree issued by Maximilian I, Viktualienmarkt (literally, victuals market) was built to replace a much smaller market at Marienplatz that had once served the needs of the burgeoning city of Munich. Victual is the Latin word for food. To the right (in Marienplatz ("St. Mary's Square")) is the New Town Hall (Neues Rathaus) which was built between 1867 and 1909 by Georg Joseph Hauberrisser in Flemish Gothic style. 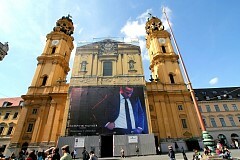 To the left, the twin-domed church is the Frauenkirche or Church of Our Lady. The foundation stone was laid by Duke Sigismund in 1468. 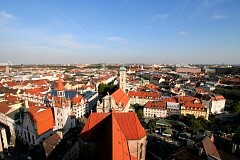 Its distinctive domes, which were built in 1525 would serve as a model for many of Bavaria's towers. The church is huge but simple. Much of the original gothic interior has been destroyed or removed partially by contra-reformists. The square was originally known as Schrannen but it was renamed Marienplatz as a way to ask Virgin Mary to protect the town from a cholera epidemic. 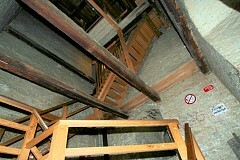 Back down the stairs to street level.